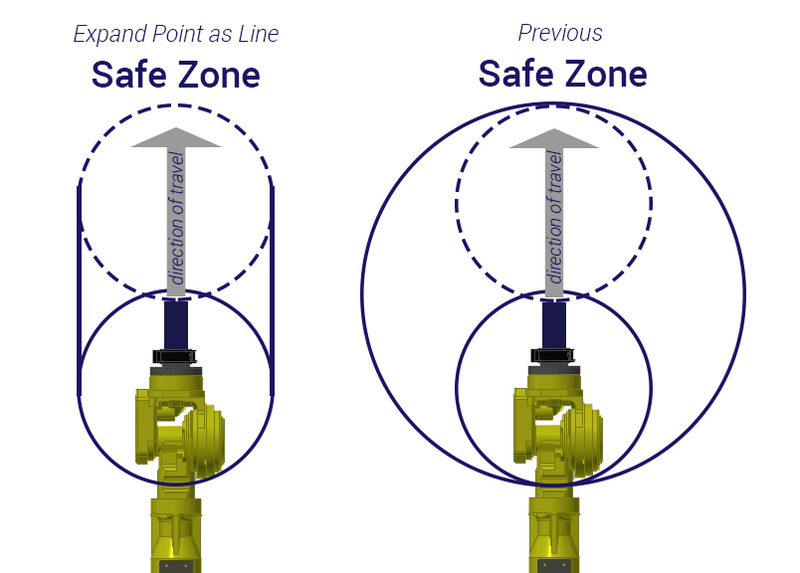 Dual Check Safety (DCS) designates safety zones in the robot cell programmatically finding areas where the robot and person cannot be at the same time. This is done through speed and separation monitoring. These areas are designated using Dual Check Safety and area scanners. The DCS technology builds zones around the robot cell. Green Zones – are out of reach of the robot therefore a safe place for the employee to work because they are not within the robot’s reach. 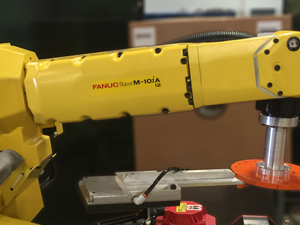 Yellow Zones – are the slow down zones – As the employee moves closer, the robot slows to show that the employee is approaching the robot’s work area. Red Zones – are the areas the robot will occupy in its process. When these areas are entered the robot stops. The predictive stop is what has been enhanced in the new release of Dual Check Safety. When the employee is in the yellow and the robot slows – the robot is still moving and like a car it has a certain stopping distance. So, this stopping distance, at the slower speed, is calculated using the speed and payload of the robot. If the employee breaks the stop line at any point along this extended path the robot stops. The safe path was calculated using an equal cushion all around the robot’s arm and EOAT. This made the “yellow” zone much smaller and the area where the robot and employee could be working together much smaller. The robot will also stop if an object is placed or detected in this safe zone. Calculates considering only the direction in which the robot is moving. The areas parallel to the robot’s motion remains unaffected by the Stop Position Prediction. The process of having employees work alongside robots is constantly improving. While this change may seem to be a small change, it does give more space for actual collaboration. Before, the system was throwing a wide net which would catch more area than it needed to and therefore cutoff productivity. The new way is casting a precise net and allowing for the best efficiency between the worker and robot. This allows better efficiency similar to the box model without the process time factor. This new DCS option is available through enabling the Expand Point as Line option on the Stop Position Prediction (SPP) menu on the HMI. In the previous version, Stop Prediction Position was global and would apply to all CPC (Cartesian Position Check) and JPC (Joint Position Check) zones. In the new version, Stop Prediction Position allows the user to enabled or disabled individual zones.